Audiovox has announced a new device called the Car Connection that helps drivers monitor, manage, and maintain vehicle health. 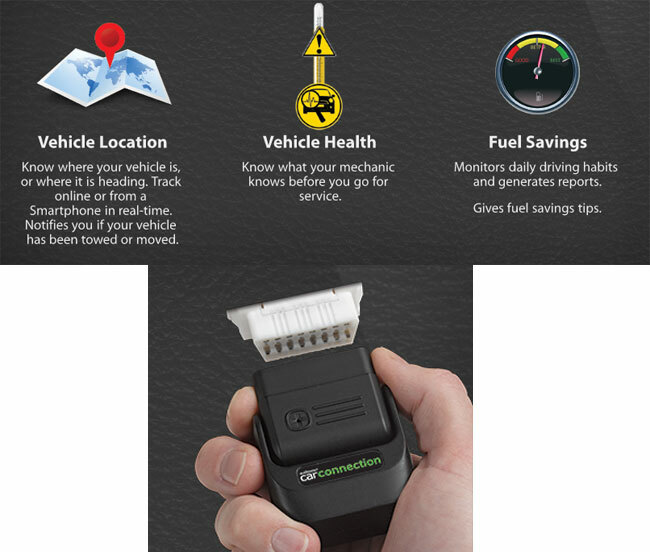 The device plugs into the OBDII port available on most vehicles since the mid-90s. When connected to the vehicle the Car Connection can monitor the driver habits to help coach drivers to be more green. When the cooler features of the device is that it will show you your vehicle location and where it’s heading. Vehicle location can be tracked online from a smart phone or notebook computer. This allows you to keep an eye on where teenage drivers are and what they’re doing, and can help police recover your vehicle if it’s stolen. Another interesting feature is that the Car Connection can work with the app operating on Android or BlackBerry smartphones to limit access to the phone when the vehicle is in motion. You can prevent users from making calls from behind the wheel or sending texts. The device operates on the Sprint mobile broadband network and requires a service plan at $9.95 per month or $89.95 per year. Both plans require a $19.95 activation fee and the device itself sells for $169.99.